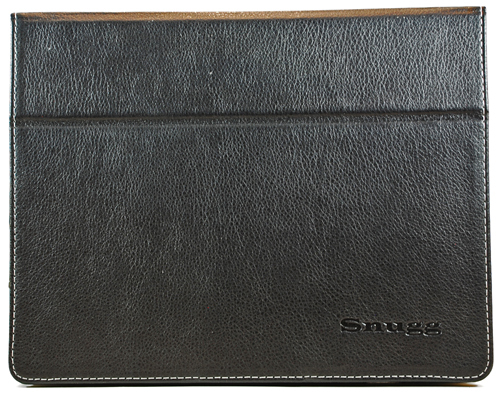 A couple weeks ago I was contacted by a representative of The Snugg, a company that makes cases for smart phones and tablets, and was offered a case to review. I don't have any of the devices that The Snugg makes cases for, but that didn't seem to make any difference. So they sent me a black, leather iPad 2 case to review. And while I don't have an iPad, I'll do my best to provide an accurate review. The outside of the case is a beautiful black leather with white stitching. Although it looks like it has a tactile texture, it actually feels smooth to the touch. The inside is a crisp black felt material, which also feels so soft, as one would expect with felt. There's an elastic band inside that confused me at first, but then I realized it's for slipping your hand in when the cover is folded back so you can hold it comfortably with one hand while having your other hand free to manipulate the screen. The border area that surround the iPad is also made of leather, and velcros down after the iPad is slid inside to hold it snug. There is a half circle cutout at the bottom for the iPad home button and a circular cutout at the top for the front facing camera. And of course a circular cutout on the back for the rear facing camera. On the top is a small loop to hold a pen or a stylus. There are two magnets inside of the border area, in the upper and bottom right corners, and they match up with magnets embedded in the cover flap. However, there are no magnets on the rear of the case so the flap isn't held against the case when it's folded open. I thought that would have been nice, but then since I don't actually have an iPad who knows if that really would be useful or not. On the back of the case is a tab/notch thing. It's for when the front cover is folded back, the cover can be inserted into the notch which turns the case into a stand. This is thanks to a crease in the front cover, and the stand can be set vertically or horizontally. Either way, the screen will be at at slight angle. It seems like a really nice case, though it's also a tad on the heavy side so it'll likely add some weight to your iPad. It also seems like they could have done something with blank space on the inside of the front flap, between the spine and the crease. It's about the width of the height of a credit card so maybe a holder for cards or an ID? The Snugg logo is sewn in near the bottom of that area. I'm not sure what else I can say about this case. It really does look nice and stylish, and seems like it's well-made. There wasn't a single stitch that was out of place. The only downsides are very minor and might not actually be downsides at all. It's hard to tell without being able to test it using a real device.